Enrich Financial Wellness is an online financial wellness platform. Innovative technologies like behavioral assessment, gamification, and adaptive learning make Enrich Financial Wellness an effective solution for personal finance management and behavior change. With its focus on engagement and variety, Enrich Financial Wellness aims to increase employee engagement and retention while alleviating employee stress and distraction. Castlight and Enrich work to make health financial decisions second nature for your employees. 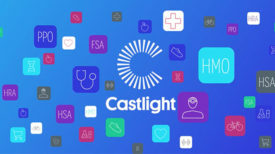 With deep integrations that allow employees to earn points for engaging in lessons, reading articles on sound personal finance practices, and making progress toward goals, Castlight reinforces the good habits they learn through the help of Enrich. Enrich is connected to the Castlight platform via a deep, data exchange integration. As users engage with Enrich, they earn points in Castlight for completing specific micro-actions, like tracking their financial wellness progress, which also helps power Castlight's personalized recommendations. Example micro-actions are shown. Employees can read personalized content specified to their needs. Employees can track their progress in areas where they'd like to grow. Employees can take Enrich courses relevant to their needs and interests.